NCHA Futurity champion Crey Zee scored 224 points in the Bonanza Open Derby, on Monday, to earn her third consecutive major title. Trained and shown by Tatum Rice for her breeders, Kevin and Sydney Knight, the Dual Rey daughter, came into the Bonanza after claiming the Ike Hamilton Derby championship, two weeks ago. Including the Bonanza win, worth $22,318, Crey Zee leads all 2019 four-year-old money earners, with $227,355. Crey Zee, first to work in the 22-horse finals, was followed by Sugrspiznevrthingniz, who scored 221 points under Matt Gaines and claimed the reserve championship. Sugrspiznevrthingniz, sired by Kit Kat Sugar and owned by Jim Vangilder, was an NCHA Futurity Open Semi-Finalist. Her $17,854 share of the Bonanza Derby purse boosted her career earnings to $27,832. Reycan In The Cash, by Dual Rey, shown by Lloyd Cox for Pat Taylor, and CR Tuff Taboo, by Woody Be Tuff, with Boyd Rice for Center Ranch, tied with 219 points for third place and each earned $13,949. 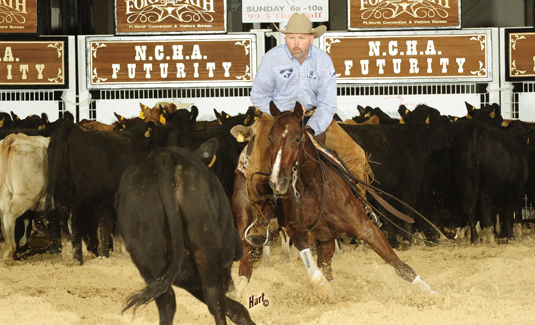 Reycan In The Cash, the NCHA Futurity Open Limited reserve champion with Greg Wright, came into the Bonanza with $53,267, which included earnings as third-place finalist under Cox in the Ike Hamilton Futurity and the Abilene Spectacular. CR Tuff Taboo had earned $125,326 under Rice as third-place finalist in the NCHA Futurity and fourth in the Ike Hamilton.